There are several caterpillars of butterflies, moths, flies and other insects that feed on vegetable crops. Caterpillars, larvae and maggots are all terms that refer to an insects life stage between an egg and a pupa. Many of the caterpillars that cause severe damage to vegetable food crops grown by gardeners and farmers in the British Isles are also considered major pests in many other parts of the world. Identification of both the adult insect and the caterpillar is the first step to preventing crop damage. 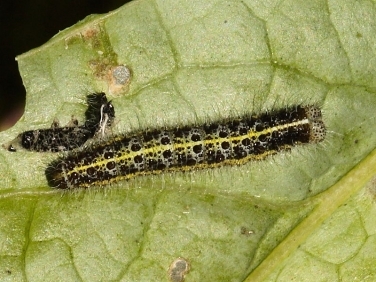 The highly conspicuous black, yellow and grey caterpillars of the Large White Butterfly,Peiris brassicae are more commonly known by vegetable growers as Cabbage White butterfly caterpillars. They cause immense damage to vegetables in the Brassica family and in particular cabbages, broccoli and brussels sprouts. 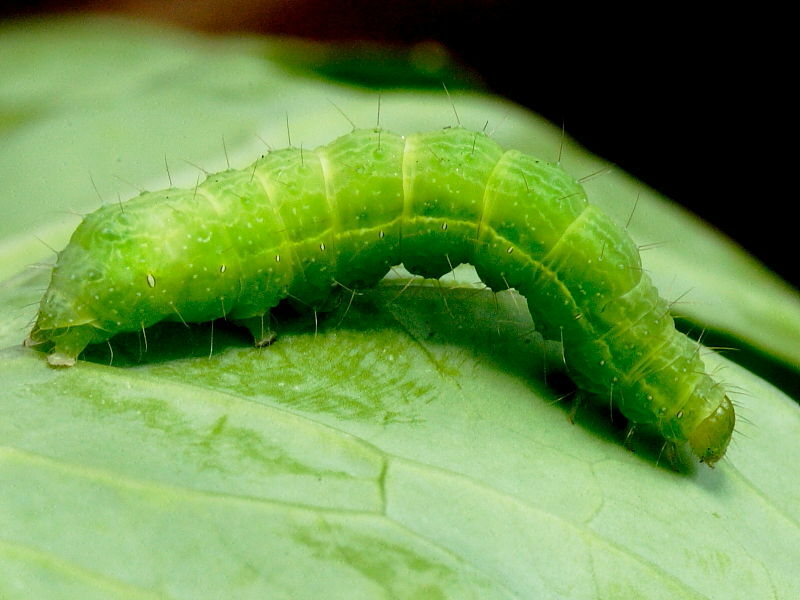 Large numbers of caterpillars can strip a vegetable of leaves in a few days leaving just bare stalks. 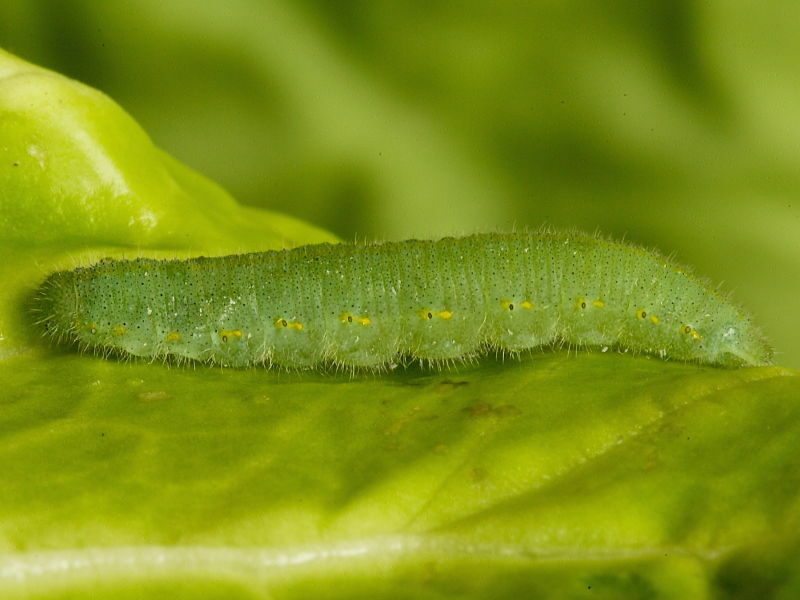 The caterpillars of the Small White Butterfly also feed on vegetables in the Brassica family. Small White Butterflies are often mistaken for the larger more destructive Cabbage White Butterfly but they have smaller, green caterpillars that do not feed in clusters. 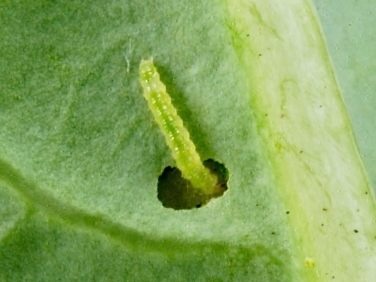 Single eggs are laid and the caterpillars feed on the underside of leaves and may penetrate the heart of the vegetable. The caterpillars of the Silver Y, Autographa gamma and the similar Ni moth, Trichoplusia ni, cause extensive damage to vegetable crops worldwide. They are referred to as Cabbage Loopers because they feed on a wide range of plants including brassica vegetables and walk with an arched looping body. In the British Isles the Ni moth is rare but the Silver Y is a common migrant that is thought to be now overwintering in the warmer south. 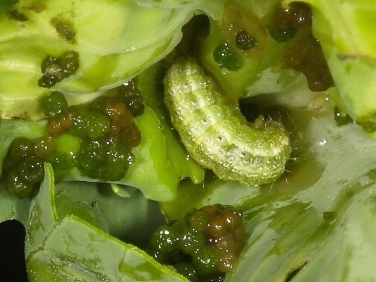 The caterpillar of The Cabbage Moth, Mamestra brassicae, is a common pest of Brassica crops in the UK and worldwide. Identification of the caterpillars is not always easy as they can be extremely variable in colour, ranging from shades of green to brown and even occasionally black. The caterpillars feed at night and hide during the day either in the soil or heart of the vegetable. The moths can have two or three generations between the spring and autumn. The caterpillars of the Garden Pebble moth, Evergestis forficalis, also known as Crucifer Caterpillars, are commonly found in allotments and vegetable gardens throughout much of the British Isles. 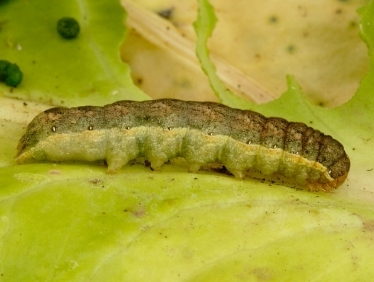 The caterpillars are double brooded and feed on a variety of cultivated brassica and other crops. The caterpillars often feed low down in the crown of the vegetable causing severe damage and soiling leaves with piles of droppings. The caterpillars of the tiny Diamond-back moth, Plutella xylostella also known as the cabbage moth, are a pest of vegetables in the Brassica family in the British Isles and worldwide. In the British Isles it is a common migrant and in parts of the warmer south is now thought to be over wintering. Their tiny size can make finding the caterpillars difficult and small holes or fenestration of vegetable leaves is often the first sign of the cabbage moths presence. The caterpillars of the tiny Pea Moth, Cydia nigricana are a pest to vegetables in the Pea family in the British Isles , North America, Europe, Australia and parts of Asia. The tiny maggot-like caterpillars of the Pea Moth feed on the forming peas inside the pods. 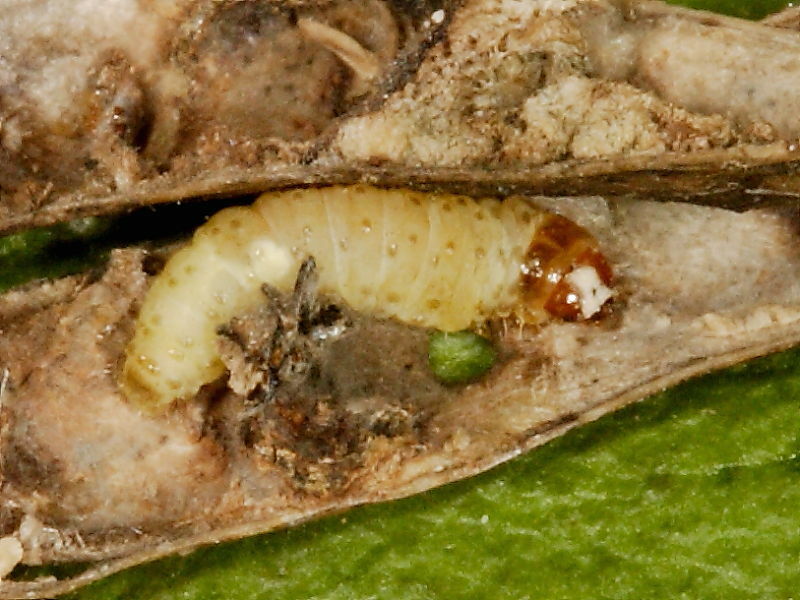 Those pods containing larvae can often be identified by the outside discolouration of the casing but the full scale of the damage to the pea crop may only be discovered upon harvest. The caterpillars of the Spinach Leafmining Fly, Pegomya hyoscyami, are a major pest of Spinach in the British Isles. 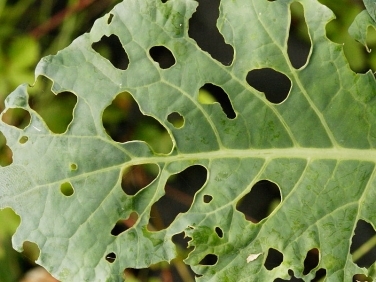 The caterpillars, commonly referred to as maggots, are small enough to feed within the outer skins of the leaf. 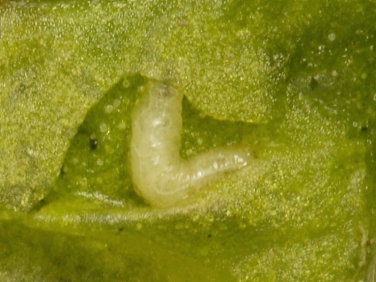 Leaf damage caused by the feeding fly maggots can be identified by pale blotches through which the outline of the larvae can often be seen. PLEASE NOTE - we have closed comments due to excess spam but are still identifying many caterpillar queries sent by email to Steve - wildlifeinsight@gmail.com - see our page on help with caterpillar identification for more information.